In his new book, Predatory Bureaucracy, conservationist Michael J. Robinson leads readers through the 120-year-history of the U.S. Biological Survey. When it began in the late 1800s, it was run by biologists mostly interested in studying stuffed birds. However, political pressure from cattle- and sheep-growers transformed the benign agency into a powerhouse dedicated to predator eradication. 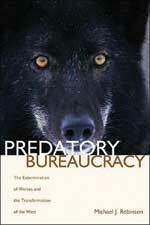 It eventually spawned the agency known as Wildlife Services. Far from being a dry chronology, Robinson’s book brings history to life through personal accounts. It includes journal entries and unpublished biographies, as well as article excerpts, ranging from an 1897 story in Forest and Stream to current articles, including several from High Country News. He draws on sources from National Geographic to Scribner’s Magazine to introduce the doggedly determined men who set traps for predators, birds and rodents on behalf of a few ranchers. The trappers’ methods were crude and cruel, but Robinson doesn’t vilify them. In fact, he seems to admire the outdoor skills of the best ones, noting how they learned to tell individual wolves apart, studied their interactions, and even began to think like the animals. Because many trappers kept detailed records, Robinson is able to trace the lives and deaths of individual wolves, which makes the history he relates even more compelling. But Robinson also shows how the government’s boundless capacity for killing changed the entire ecology of the West. Thousands of wolves, bears, mountain lions and coyotes ended up in the agency’s snares; trappers also destroyed scores of prairie dogs, magpies, eagles, and anything else deemed a nuisance. The book concludes in the present, detailing changes caused by the Endangered Species Act, and summing up the plight of predators today. In the end, the author makes a powerful argument against repeating history by allowing politics and prejudice to destroy this vital part of Western ecosystems.